CBS announced Thursday that it has fired Don Imus from his radio program, following a week of uproar over the radio host's derogatory comments about the Rutgers women's basketball team. "There has been much discussion of the effect language like this has on our young people, particularly young women of color trying to make their way in this society," CBS President and Chief Executive Officer Leslie Moonves said in announcing the decision. One of those discussions took place at noon today with a coalition of leaders from the civil rights and women's movements, who said it was time for Imus to go, reports CBS News correspondent Nancy Cordes. "It's important that we stand with the women of Rutgers who are deeply hurt by the highly insensitive comments of Don Imus," said Marc Morial, CEO of the National Urban League. It's a stunning fall for one of the nation's most prominent broadcasters. Time Magazine once named the cantankerous host as one of the 25 Most Influential People in America, and he is a member of the National Broadcaster Hall of Fame. But Imus found himself at the center of a storm after he called members of the Rutgers team "nappy-headed hos" last week. Protests ensued, and one by one, numerous sponsors pulled their ads from Imus' show. On Wednesday, MSNBC dropped its simulcast of the program. The Rev. Al Sharpton and Jesse Jackson met with Moonves to advocate Imus' removal. Jackson called the firing "a victory for public decency. No one should use the public airwaves to transmit racial or sexual degradation." Said Sharpton: "He says he wants to be forgiven. I hope he continues in that process. But we cannot afford a precedent established that the airways can commercialize and mainstream sexism and racism." Sumner Redstone, chairman of the CBS Corp. board and its chief stockholder, told Newsweek that he had expected Moonves to "do the right thing," although it wasn't clear what he thought that was. The news came down in the middle of Imus' Radiothon, which has raised more than $40 million since 1990 for good causes. The Radiothon had raised more than $1.3 million Thursday before Imus learned that he lost his job. "This may be our last Radiothon, so we need to raise about $100 million," Imus cracked at the start of the event. Volunteers were getting about 200 more pledges per hour than they did last year, with most callers expressing support for Imus, said Tony Gonzalez, supervisor of the Radiothon phone bank. The event benefited Tomorrows Children's Fund, the CJ Foundation for SIDS and the Imus Ranch, which hosts kids with cancer. Imus, who was suspended by CBS Radio for two weeks without pay beginning next week, was in the awkward situation of broadcasting Thursday's radio program from MSNBC's studios in New Jersey, even though NBC News said the night before that MSNBC would no longer simulcast his program on television. He didn't attack MSNBC for its decision — "I understand the pressure they were under," he said — but complained the network was doing some unethical things during the broadcast. He didn't elaborate. He acknowledged again that calling the Rutgers women's basketball players "nappy-headed hos" a day after they had competed in the NCAA championship game had been "really stupid." He said he had apologized enough and wasn't going to whine about his fate. "I said it," he said. "I wouldn't be here if I didn't say it." Sharpton and Jackson emerged from a meeting with Moonves saying the corporate chief had promised to consider their requests. "It's not about taking Imus down," Sharpton said. "It's about lifting decency up." While Imus' dismissal may seem like a huge story, it is not the first time something similar has happened, reports Jeff Greenfield, CBS News' soon-to-be senior political correspondent. Bob Grant, a popular New York radio host, was put off the air for calling the African-American mayor at the time a "washroom attendant." And Jimmy "The Greek" Snyder lost his CBS job on NFL football pre-game telecasts by saying black athletes were superior to white athletes. Throughout all of this, Imus has said he wants the chance to apologize to the 10 players face to face, adds Cordes. On the "Oprah" show today, the team indicated that could happen very soon. "We promise to come into this meeting with an open heart and open mind," said C. Vivian Stringer, Rutgers' coach. Sheila Johnson, owner of the WNBA's Washington Mystics and, with her ex-husband Robert, co-founder of BET, called Imus' comments reprehensible in an interview with The Associated Press. She said she had called Moonves to urge that CBS cut all ties with the veteran radio star, and was worried that what he said could hurt women's sports. "I think what Imus has done has put a cloud over what we've tried to do in promoting women's athletics," she said. Before the CBS announcement, several sponsors, including American Express Co., Sprint Nextel Corp., Staples Inc., Procter & Gamble Co., and General Motors Corp., had said they were pulling ads from Imus' show indefinitely. Imus made a point Thursday to thank one sponsor, Bigelow Tea, for sticking by him. The list of his potential guests had begin to shrink, too. Newsweek Editor Jon Meacham said the magazine's staffers would no longer appear on Imus' show. Meacham, Jonathan Alter, Evan Thomas, Howard Fineman and Michael Isikoff from Newsweek have been frequent guests. Imus has complained bitterly about a lack of support from one black politician, Harold Ford Jr., even though he strongly backed Ford's campaign for Senate in Tennessee last year. Ford, now head of the Democratic Leadership Council, said Thursday he would leave it to others to decide Imus' future. 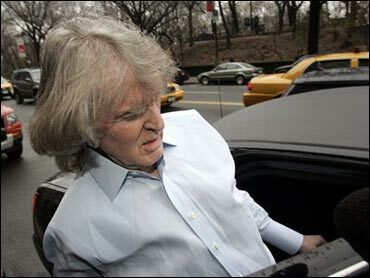 "I don't want to be viewed as piling on right now, because Don Imus is a good friend and a decent man," Ford said. "However, he did a reprehensible thing." Imus' troubles have also affected his wife, author Deirdre Imus, whose household cleaning guide, "Green This!" came out this week. Her promotional tour has been called off "because of the enormous pressure that Deirdre and her family are under," said Simon & Schuster publicist Victoria Meyer. People are buying the book, though: An original printing of 45,000 was increased to 55,000. Yet he's clearly became a political liability for a major corporation — CBS. (General Electric Co. owns NBC Universal, of which MSNBC is a part.) NBC News said anger about Imus among some of its employees had as much to do with ending the MSNBC simulcast as the advertiser defection. Bryan Monroe, president of the National Association of Black Journalists and vice president and editor director of Ebony and Jet magazines, met with Moonves on Wednesday. It seemed clear Moonves and his aides were struggling with a difficult decision, he said. He urged them to take advantage of an opportunity to take a stand against the coarsening of culture. "Something happened in the last week around America," Monroe said. "It's not just what the radio host did. America said enough is enough. America said we don't want this kind of conversation, we don't want this kind of vitriol, especially with teenagers." Rutgers' team, meanwhile, appeared Thursday on "Oprah" with their coach, C. Vivian Stringer. At the end of their appearance, Winfrey said: "I want to borrow a line from Maya Angelou, who is a personal mentor of mine and I know you all also feel the same way about her. And she has said this many times, and I say this to you, on behalf of myself and every woman that I know, you make me proud to spell my name W-O-M-A-N. You've really handled this beautifully." Imus said Thursday he still wants to meet with the team. "At some point, I'm not sure when, I'm going to talk to the team," he said. "That's all I'm interested in doing." Team spokeswoman Stacey Brann said they will meet Imus before the end of the week. Stringer is scheduled to be out of town on a recruiting trip Saturday, she said.